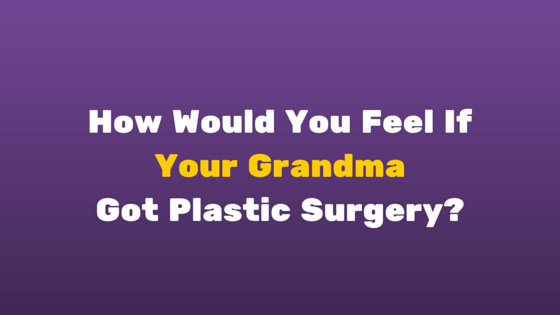 How would you feel if your mom or grandma said they were going to get breast augmentation or a facelift? Would you be shocked, disturbed or supportive? Whether you like it or not, the older generations like the Baby Boomers are having plastic surgery to maintain or revamp their appearance. They’ve thought about it long and hard, they have disposable income and they’re sure about their decisions. While a lot of media attention has been on teenagers and plastic surgery lately, we can’t overlook that older generations make up a large chunk of those who get plastic surgery. In 2014, people between the ages of 51-64 made up 24% of the total surgical procedures performed in the U.S. That’s 433,517 procedures performed on this age group. People who were age 65 and up accounted for 7.9% of total surgical procedures. That’s 138,612 procedures. Dr. Mulholland, a Toronto plastic surgeon, says that Baby Boomers (those who were born in 1946-1964) are an interesting generation. “Their mothers and grandmothers were the descendants of a religious work ethic. They were more accepting of life and aging. It was a matter of what God had dealt them in life,” he says. The Baby Boomers are totally different from their mothers in terms of attitudes. He says these women want a certain quality of life and will achieve it on their own if they have to. Dr. Mulholland sees many female clients in their 40s at SpaMedica. “They’re far less likely to be manipulated by the media—and the media’s idea of beauty—than women who are a generation younger,” he says. They’re not coming in for treatments because they want to look like a certain celebrity. It stems from their dissatisfaction of their looks compared to the rest of their lives. Simply put, they want the whole package. They have an active life, family and fulfilling career; they want their appearance to reflect how they feel inside. Dr. Mulholland appeared on Global news to talk about women in their 60s getting breast augmentation. Which Plastic Surgery Procedures Are These Women Having? Some of the most popular procedures amongst this group are breast augmentation and liposuction. After having children, a lot of women deal with stubborn fat or a loss of volume in their breasts. For these reasons, they seek procedures that can enhance their bodies. For non-surgical procedures, the Pan G lift is another common treatment that’s performed. The Pan G Lift provides similar results that a facelift would give without surgery.